The Ramada Hotel in Sutton Coldfield is a 4 star hotel who offer the full hotel facilities. The location of the hotel is perfect to attract customers as the surroundings include Birmingham NEC, NIA, Drayton Manor and Cadburys World. As well as the wide range hotel rooms Ramada offer meetings, an events venue, and leisure facilities with great prices. 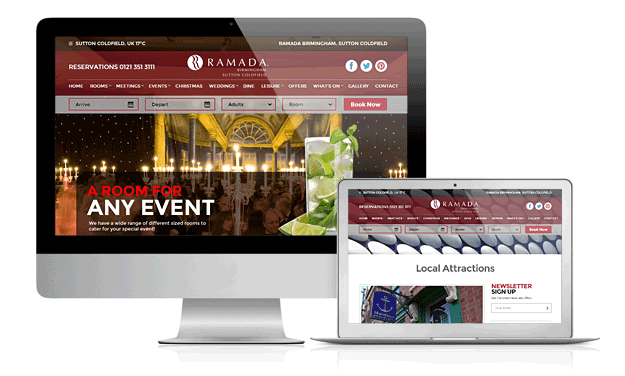 HeadRed have worked with Ramada to give the website a more updated look. Another aspect which has been improved is that there are more landing pages to showcase the hotel. For example, each room type has its own page to improve the user experience. The new website was created on WordPress as it allows a better access when updating information and flexibility. Take a look at Ramada Hotel’s new site, visit: http://www.ramadasuttonhotel.co.uk and let us know what you think!